Great News! Dr. Will was once again selected "Top Dentists" for the June edition of 5280. We are especially proud of this honor because the "Top Dentists" for Colorado are selected by peer review through an anonymous survey so it is a real honor to be included. We are also proud to announce that we will be installing a new cone beam CT scan machine http://www.gxcb500.com/ in our office. This equipment will allow us to view anatomy in 3 dimensions providing a significant advancement in the quality of care in our office. We are one of only a handful of offices with this technology. This device is similar to a traditional CT scan machine except the amount of radiation is significantly reduced. Please pardon our dust. We will be updating office fixtures from June 18th through July 3rd in addition to installing our new Cone Beam CT scan machine. Since there will be some noise and possibly dust while a wall is moved, we will close the physical office space from June 25th through July 3rd. We will forward our phone lines to another location where our Office Manager Cathleen will be available to schedule appointments or answer your questions. She will have remote access to all office information as we have electronic charts. Lasers in periodontics. I am often asked why we do not use lasers in the office as part of our comprehensive periodontal care. Since the office utilizes so many new technologies, would it not seem counter to this model to not utilize a new laser? The answer is no. While lasers seem very new and high tech, they have been around for quite a long time. In fact, I recall using three different lasers in 1998. This is over ten years ago! At that time the lasers were extraordinarily expensive and were only available in academic institutions as they were cost prohibited for clinical practice. As the cost of lasers dropped over the next decade, more clinical data became available. Unfortunately, the clinical data has not matched the hype with lasers. In fact, there are published reports of damage to root surfaces with the use of lasers. As a specialist in Periodontics, it is my responsibility to provide the best possible care for my patients and minimize any complications. With this in mind, I do not feel lasers provide a clinical benefit greater than that from other treatments that are available. I always feel that the "Proof is in the pudding". In other words, the clinical outcome is what matters. It is simply not worth the additional expense to my patients and likely treatment failure to use a laser. This opinion is also shared by the American Academy of Periodontology. Follow this link if you would like to review the literature yourself: http://www.perio.org/resources-products/pdf/lr-lasers.pdf . Perhaps the technology will progress over the years and, if this is the case, you will find a nice new laser ready for use in my office. We are all excited for the upcoming winter season and have started preparation for all contingencies in the case of inclimant weather. Also, we have recently installed an optical scanner to give us the ability to remove paper charts from our office. Paper charts are fast becoming an antiquated system. By moving to a chartless system, this will allow us to minimize transcriptional errors and save a significant amount of time needed to sort and file the old paper charts. We have already been using electronic insurance filing systems, but this new addition will be the final implimentation needed for a completely chart free office. Several changes have been made to the office over the past few months. First of all we would like to welcome our newest staff member Vanessa. We are happy to have her join our team. Also, we have continued to implement 3D imagery into our daily patient care including the utilization of software to make our CAT scan data easier to view. This software also allows for virtual surgical procedures to permit treatment planning with more information and therefore better outcomes. In other words, we can often avoid more "exploratory" procedures and have a better idea what outcomes are possible. We continue to utilize in office anesthesia both by Dr. Will and also an outside Anesthetist who will come to our office to provide complex anesthesia for longer procedures. Lastly, Dr. Will held his annual continuing education meeting in early May with excellent turnout by Denver dentists. Richard Graham from New York was flown out to lecture on the utilization of "hybrid" appliances. These appliances are particularly useful to assist patients who have lost all of their teeth to have a wonderful smile and return to a level of function approaching natural teeth. Perhaps the most exciting news is that Dr. Will was once again selected to be included as one of Denvers "Top Dentists". This list is generated through an anonymous vote by colorado dentists on their opinion of other dentists. We are moving! Below is a mockup of our new space that should be completed in April 2012. After nearly 40 years at our current location, it is time to move. We will be moving to 41st and Kipling St approximately 1.2 miles to the north of our current location in late April 2012. We will update the map on the "contact us" page after completing our move. 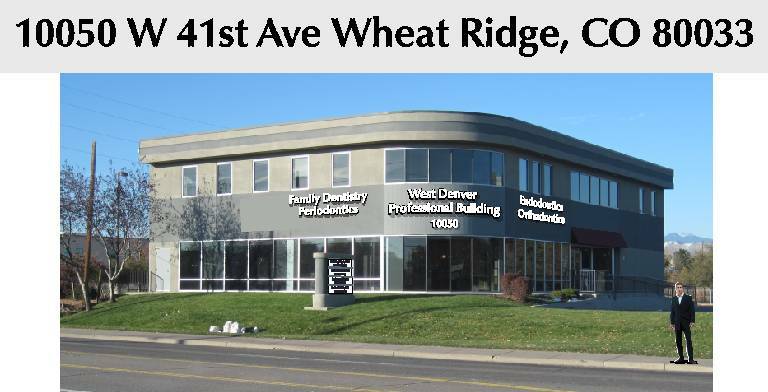 We are also proud to report Dr. Will was once again selected as one the Denver's top dentists. He was profiled in both the July 2011 and January 2012 5280 Magazine as part of this honor. Lastly, we have instituted a new protocol for many procedures in our office using a Piezo electric unit. This unit will provide more comfortable procedures for our patients while reducing the likelihood for complications. If you are interested in hearing more about this exciting new technology, please ask. We have more good news! 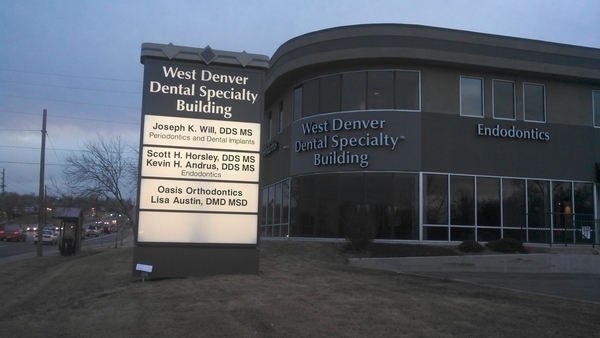 Dr. Will was again selected as one of Denver's "Top Dentists". This is a great honor as the selection process is by Denver area dentists through a survey. Dr. Will is honored to be recognized by his peers. Dr. Will is now recruiting patients for an interesting study to demonstrate a modified soft tissue grafting procedure. This procedure is performed to augment gingival tissue on receding gum tissue and it is expected this technique will provide more esthetic results. If you have been referred for soft tissue grafting or "gum grafting", ask if you are a candidate for this procedure. Quality dental care can only be achieved with solid communication and business practices. We are happy to be a part of the Better Business Bureau with an A+ rating! More innovation is underway! We have added a new video education system to the office to allow for the presentation of videos to our patients in all 7 televisions and monitors. This system updates with our Facebook account and provides important information about follow up care and what can be done to have a healthy mouth. Also, the system will give entertaining information about current events so that our patients are entertained while in the treatment rooms. We just added a new Diode Laser to our armamentarium. This technology allows us to provide "biostimulation" to promote healing. This laser can also be used in treating periodontal disease and for precise excision of oral lesions. Look for Dr. Will in the June 5280 magazine's "Top Dentist"! There as been a significant breakthrough in dental implant surgery with 3D guided surgery. Up until now we could plan our surgery using 3D imaging but in order to move that plan to actual practice we would need to fabricate a surgical guide. This guide would not allow real time imaging to provide the most precise surgical technique. This is where our new xNav system comes into place. You can see a video of the technique below.